A lot to offer. 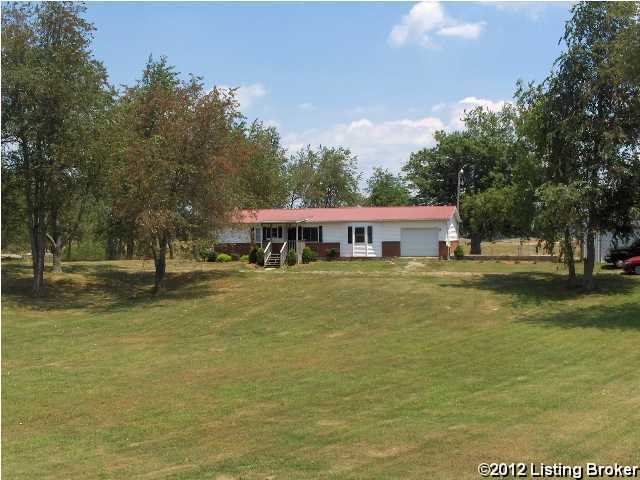 3.166 acres, 2 car detached garage, 1 car attached garage, full unfinished basement, enclosed sun room. New laminate flooring in living room, hall, and bedroom. New faucets and lights in bathrooms. Spa stays. Close to Fort Knox. New countertops. Room to store your RV. LISTING PROVIDED COURTESY OF Jeffrey Pitts, RE/MAX Executive Group, Inc.
95 Kentucky Hills Rd, Vine Grove KY 40175 is a Home, with 2 bedrooms which is recently sold, it has 1,428 sqft, 0 sized lot, and 1 Car Garage,2 Car Garage,Attached,Detached parking. A comparable Home, has 3 bedrooms and 1.5 baths, it was built in and is located at 413 Knox Ave Vine Grove KY 40175 and for sale by its owner at $ 134,500. This home is located in the city of Vine Grove , in zip code 40175, this Hardin County Home, it is in the NONE Subdivision, and JENNINGS KNOB are nearby neighborhoods.